« Just how important is tonewood to you? Tone Freak Effects Abunai 2: A Tube Screamer Replacement? When I stumbled upon Tone Freak Effects as I described in a recent article, I didn’t let on that with the Abunai 2, there might be a Tube Screamer killer in my midst. As you may know if you’re a regular reader here at GuitarGear.org, I love my Tube Screamer. It is the one overdrive pedal that has stayed on my board for years. That creamy-smooth distortion with the mid-range bump just stirs me to the core. I use it all the time, even though I’ve been playing GREAT amps that break up beautifully. 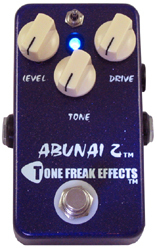 So it is with incredible excitement and anticipation that Dereck over at Tone Freak Effects is sending me an Abunai 2 to evaluate. I’m always a bit dubious about overdrive pedals, and always make the comparison to my beloved Tube Screamer when I run across new ones. But the more I listen to the sound clips, and read reviews on the web about the Abunai 2, the more I’m thinking that if this pedal performs as well as the clips suggest, my Tube Screamer may have some serious competition. The thing that REALLY turns me on about this pedal is that it has three switchable clipping configurations in addition to the gain, drive and tone knobs. That kind of versatility is extremely intriguing to me. We shall soon find out in the next couple of weeks. The main reason I retired and have learned to not like TS type boxes much any more, is the single tone control which really amounts to a treb roll off w no real low end enhancement or boost. It’s novel at first but really limiting in the long term. Even the switch mod on the above box and the Fulltone OCD starts running pale because of the single tone control roll off circuit. I always liked my OCD because it could be a cleaner darker mode tone but still no real low end enhancement and the mid range bump can be arrived at in so many ways. After all the center point of the guitar spectrum is usually the exact point where the “scoop” tone proponents cut. An ironic paradox to to be sure. A little mid around 1K and there is the bite and presence of classic rock guitar. Try running that seemingly cool scooped tone w it’s bass and high end outside the studio, recording, or alone mixed in with a band and find out how it does not have any real presence or fidelity of tone unless it is drownign out everything else in a wash of volume. Newer ODs are starting to give a separate tone control for bass and treb boost and cut. Notable entries are the Hardwire Tube OD box and the new Vox JS Ice 9 which promises to be a real state of the art in OD change. Barber is making some of the best ODs one can find and he opts for a push pull on many of the “tone’ controls plus as many as 4 internal trim pots to adjust and enhance the bass, mids and treb to taste. And really for the cost and magnificent tonal ranges you cannot touch a Barber custom pedal overdrive!